00:05:00 Makes 1 serving (82 g). Makes 1 serving (82 g). Sandwiches go circular! 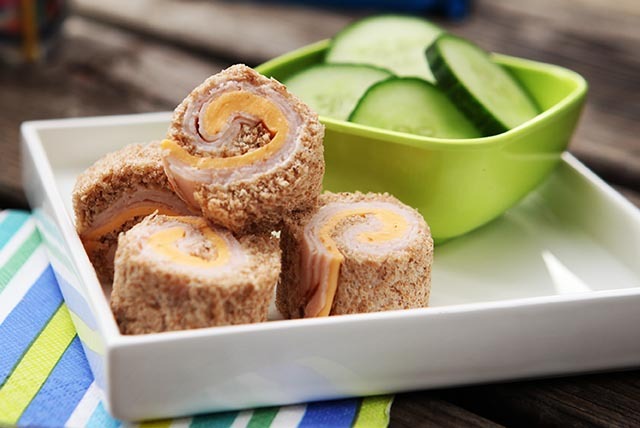 Surprise your little ones with these cool bite-sized pinwheels. Flatten bread with rolling pin or drinking glass. Spread bread slice evenly with Miracle Whip. Cut crosswise into 4 pinwheels. Stack pinwheels on top of each other and wrap in plastic wrap. Make 2 wraps for older children. Serve with 6 cucumber slices, 1 pkg. (single serve) Chips Ahoy! Cookies or Oreo Cookies and 1 pouch Kool-Aid Jammers Beverage. Serve with 1 banana,1 pkg. RITZ and Cheese HANDI-SNACK and and 1 pouch Kool-Aid Grape Jammers. Serving Size Makes 1 serving (82 g).